The Macclesfield Canal runs from Marple Junction in east Cheshire to Kidsgrove in Staffordshire. The canal is one of six that comprise the 'Cheshire Ring'. The canal runs 26 miles from Marple Junction at Marple, where it joins the Upper Peak Forest Canal. When the Trent and Mersey Canal was completed in 1777, the further need was perceived for an alternative route between Manchester and the Midlands. A route through the silk manufacturing centre of Macclesfield seemed an obvious choice. In 1825 Thomas Telford (though William Crosley subsequently became the canal's engineer) was asked to investigate the feasibility of a route linking the Peak Forest Canal and the Trent and Mersey. 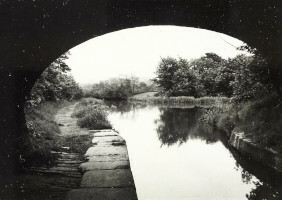 The canal was opened in 1831.